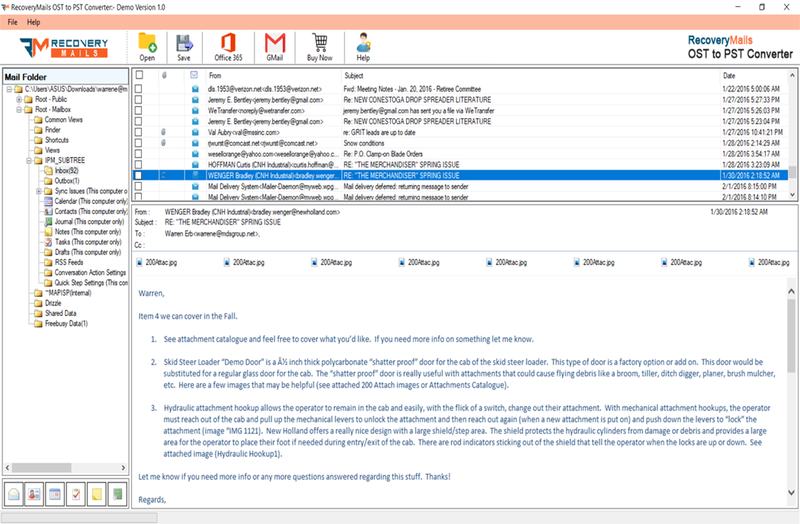 Convert all OST Mailbox folders - Emails, Calendar, Contacts, Task, Journal etc. with all properties - To, From, Bcc, CC, Time, Subject, Size, Attachment etc. 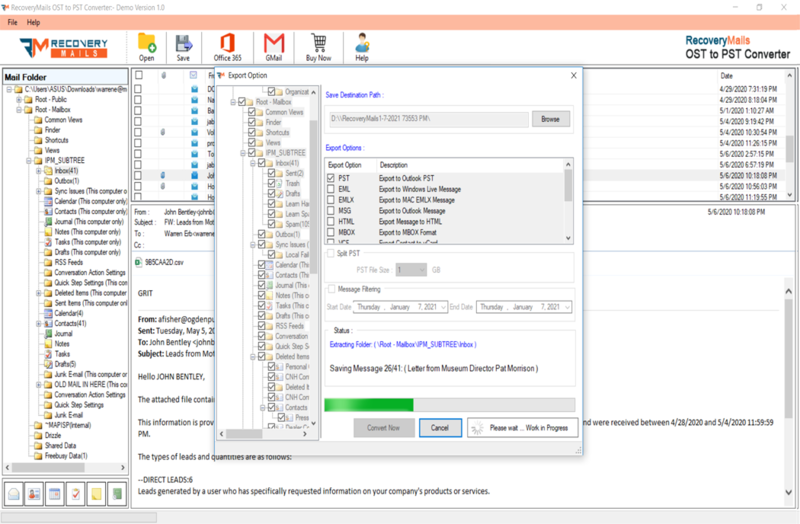 Software works with all MS Outlook version - 2019, 2016, 2013, 2010, 2007, 2003, 2002, and 2000. 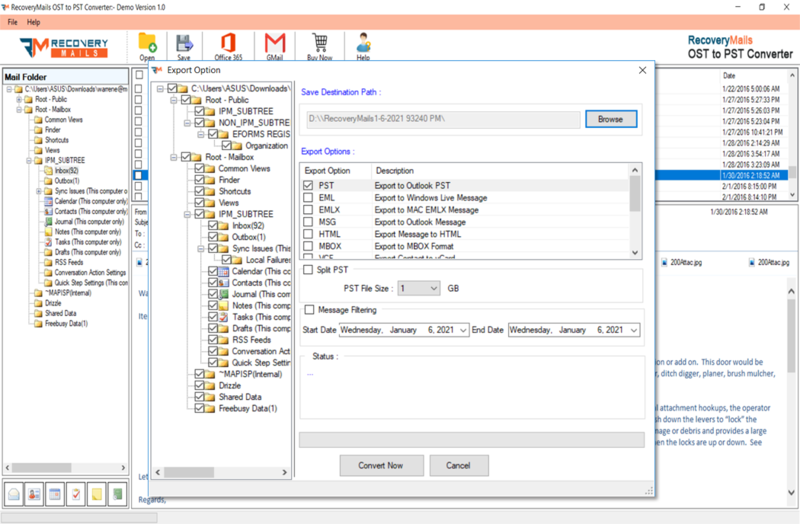 RecoveryMails for OST To PST software is the ultimate solution to convert Offline OST mailbox data to Outlook PST file format. 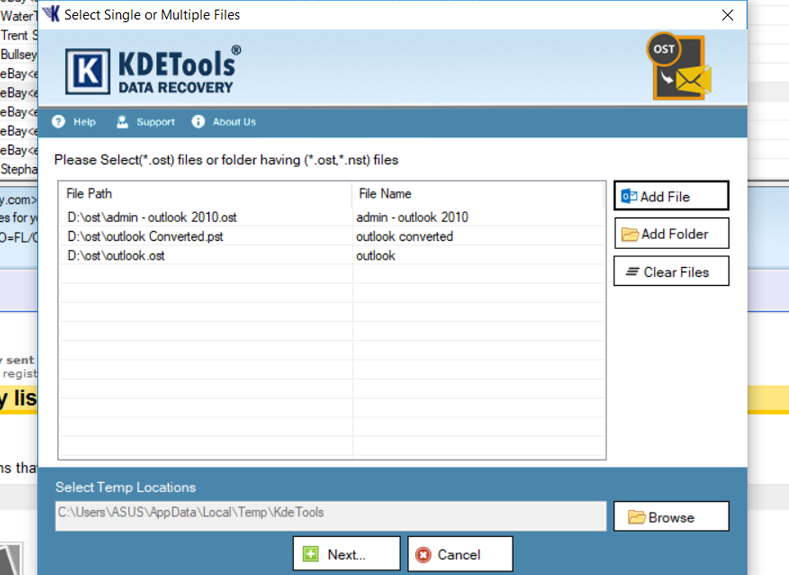 This new version of software has many update and new features which allow user to recover multiple inaccessible OST file & export all items from OST to various file format. 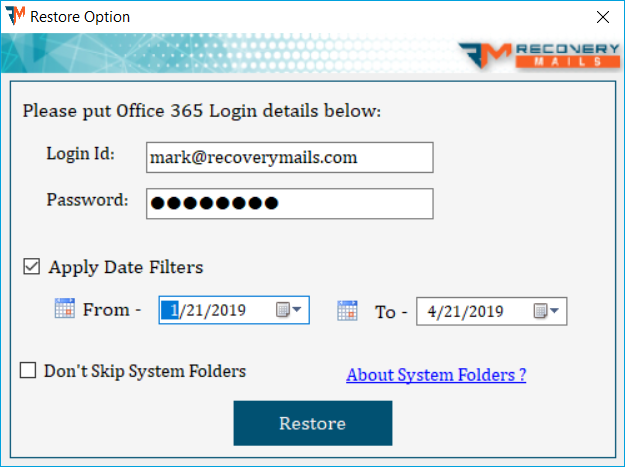 RecoveryMails OST to PST converter has worked wonders for conversion data of Offline OST file to PST after successfully, then import converted PST data to Outlook 2016. This application I use and export to. 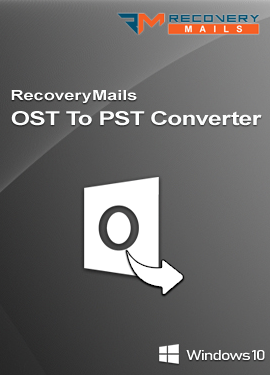 Giving a try to your RecoveryMails OST To PST Converter solution before making actual buy was a wise choice. Truthful Exchange OST file repair and recovery results made your software extremely appraisable. Congrats for the nice work done. Export Options has 3 different options to add OST file. Select Folder - Select a particular folder/drive which contains OST files for loading multiple OST files in one go. 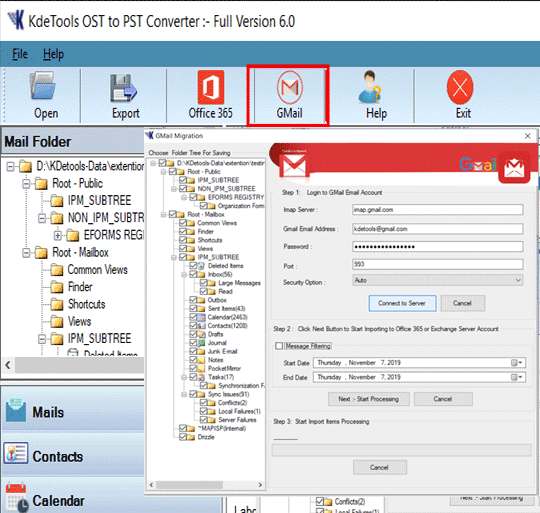 Using OST To PST Converter Software the user can convert all OST Items in different file formats: Such as PST / EML / MBOX / MSG / vCard (Contacts) / vCal/ICS (Calendar) file formats. Create Seperate PST File for Each OST File - After loading multiple OST files, user want to save each OST file to seperate PST file format. Apply Date Filter - Using Filter option, you can filter the valuable email items from OST file to other format. Don't Skip System Folders - Check this option to avoid the unnecessary system folders from being converted in the output file's folder. Naming Conversion - You can decide the naming conversion to save file by date, subject, to, cc etc while converting. Note: Apply Date Filter & Don't Skip System Folder are available in all format, but Naming Conversion is available EML & MSG format only. OST Conversion software allows you to migrate your complete Items such as Mail folder along with attachments, Calendar, Contacts, Tasks, Journal etc. 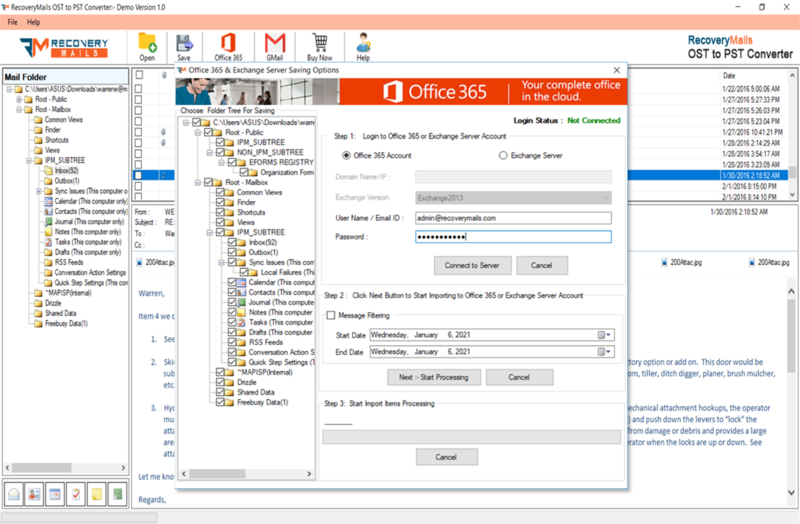 from single or multiple OST file(s) to a cloud-based Office 365 Admin/User Account Credentials directly without any loss data. By providing the credential details; Login Id & Password of the respective Admin/User account and proceed for migration. Note: Apply Date Filter & Don't Skip System Folder are available in Office 365 Restore Option. 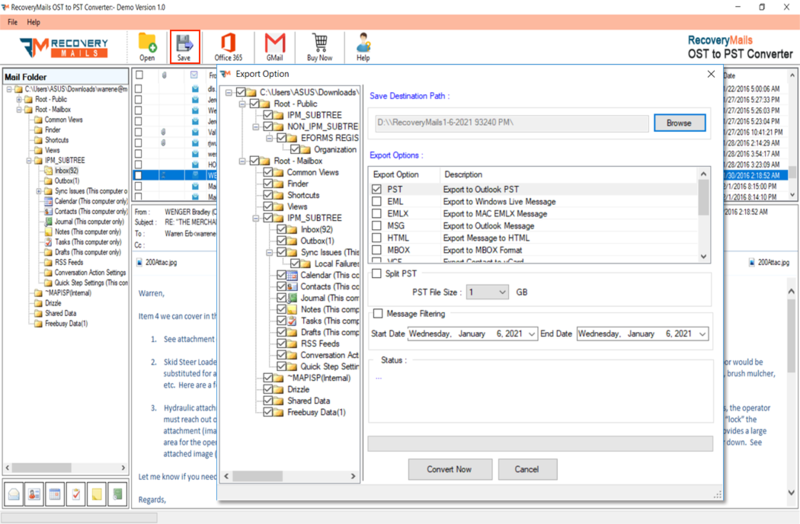 Demo version allows you to generate Preview of contents of OST mailbox data & Export only 30 Items per Folder from OST file to PST, Office 365, EML, MSG & MBOX. 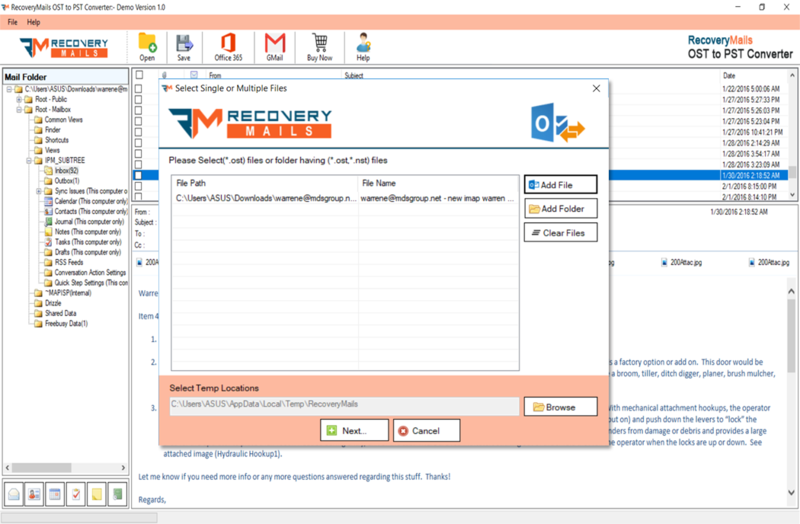 Launch RecoveryMails OST to PST Converter software on your system. 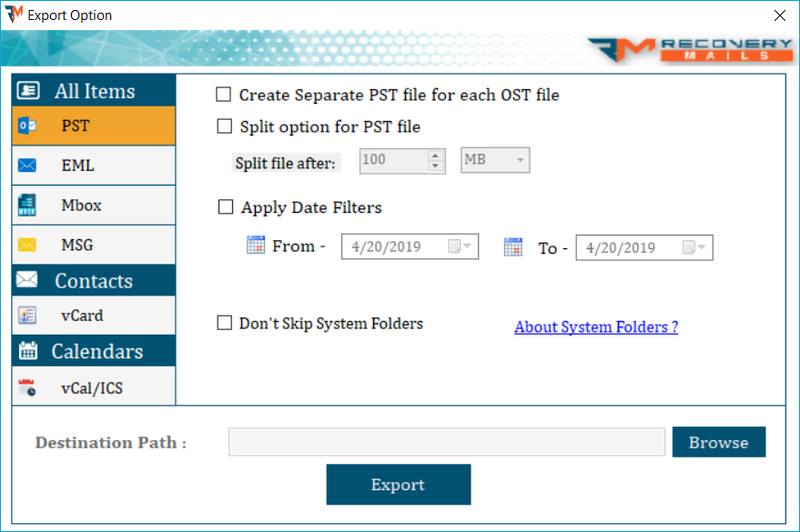 For Single File, then Click "Add Files" button to select a particular OST file OR For Select Folder, then Click "Browse" button to select Multiple OST files, that you want to convert. Within a few minutes, the loading files process will be finished successfully. Click Finish. Expand the folders one by one loading messages and to check messages preview with its properties & attachments. Click on Export File button to Select the file format and Browse to select a location where you want to save the new PST file. Click Export to start the conversion process. Please wait until it gets completed along with show status process. Within a few minutes, Conversion done is successfully completed. Click OK.
Software will be generated report and saved file on your location. What are the possibilities of accessing the contents of an Exchange offline mailbox when in orphan state? 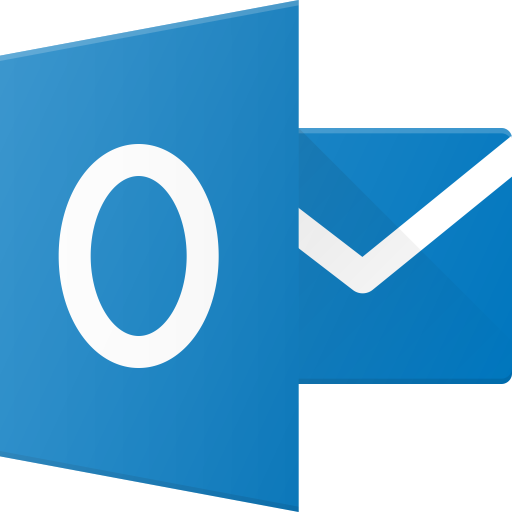 The Exchange offline mailbox as OST of users can be saved to MS Outlook PST file format using this OST to PST Converter for retrieval the access of its contents for commercial stability. The procedure to convert orphaned OST file to PST file is very simple to understand with this OST converter tool. What can I save using the trial version of software? With the trial version of the software, you can save only 30 items per folder. However, in order to save all OST items, you need to purchase the full version of the software. What is the need to convert Exchange OST file to PST file? 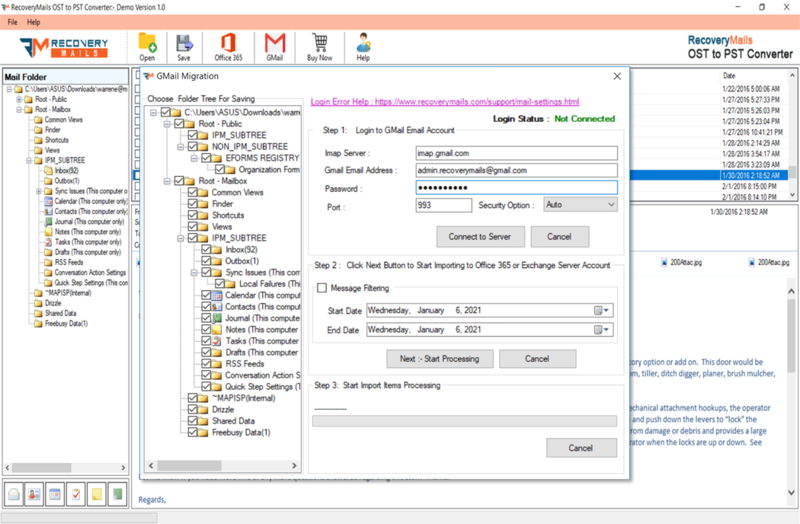 Your OST emails mailbox on the Exchange Server is accidentally deleted and you need to access your emails. You are facing issues while synchronizing Outlook with Live Exchange Server. How much time does OST Conversion software takes to perform conversion procedure? Depend on heavily size of your OST file to take time to perform conversion process. Is Software repair corrupt OST file? Yes, Software easily convert corrupted OST file into PST file. What if I have an issue after the OST file conversion?